Holly Tree features ten lighted, Fast-Dry clay courts. This modern court compound offers many advantages such as, reduced risk of injury, cooler court temperature, quick-drying after rain, and a beautiful playing surface. Court pods are made up of 2 -3 courts and a gazebo with cold water stations. The wide courts also feature convenient ball-return corners. Kirk, a certified PTR Professional, has been teaching for over 35 years and at Holly Tree for the last 20 years. He is also the tennis coach for the New Hanover High School boy's tennis team. He was awarded the Mid-eastern 4A 2014 coach of the year. Prior to Holly Tree Kirk had been in Chicago for 15 years as a Head Pro. Kirk is a 5.0 level player, has won many doubles titles, most recently the 2015 NC State Closed Championships. Kirk played his college tennis at Northern Michigan University where he played NO. 1 Singles & Doubles his Junior/Senior years. He also coached the team as well. 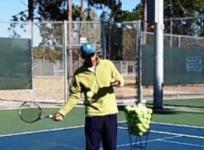 Koko, a 5.0 level player, has over 12 years of experience teaching adults, juniors, and kids of all levels. He was a top ranked junior in Dubai while growing up and also a nationally ranked player in Pakistan. He played at Queens College in Charlotte and was ranked as high as #6 in singles and #7 in doubles in the nation in NCAA Division II tennis. Along with being the former Head Men's Tennis Coach at the Queens University of Charlotte, he helped conduct a junior development program in Charlotte alongside a former top 25 player in the world (Tim Wilkinson) training some of the top juniors in the country. Joann, a 4.0 level player, is a certified PTR Teaching Pro, specializing in 10 and Under Tennis and teaching beginners of all ages. She has coached middle school and USTA junior tennis teams, as well as tournament players. ﻿As Junior Program Director, she oversees all after-school juniors clinics, summer camps, and Quarter Court activities. Contact her directly at 910-620-1332, at the club 910-791-2746, or by email joannbristol@mac.com.